Geography tends to be a subject that homeschool moms aren’t sure how to teach and more than likely this is because there aren’t tons of resources out there to use in your homeschool. Adding geography to your homeschool isn’t hard to do and it provides a lot of opportunities for hands-on learning which kids love! One of the easiest ways to study geography in your homeschool is to begin with the place where you live. Kids are often more interested in discovering geography when it begins with where they live. Once your children understand the geography around them they’ll be excited to learn about all of the amazing geographical locations throughout the world! The study of geography opens up the world to your children right inside your home! You don’t have to follow a textbook to teach your children geography, in fact I believe that geography is best learned through fun, hands-on learning! If you’re not sure how to get started with teaching geography in your homeschool, I hope that these 10 ways will help you study geography into your homeschooling! If you’re already teaching geography perhaps adding these fun, hands-on geography activities will inspire your kids to want to learn more about different places in the world! The study of #geography opens up the world to your children right inside your home! Kids love to learn about places they can see, touch and hear. If you’re studying the place where you live, make geography come alive to your kids by taking them on field trips to mountains, oceans, rivers, deserts, etc. that they’ve learned about. Make geography come alive by allowing your children the opportunity to experience it first hand! Learning how to create and detail maps is a lot of fun! Your kids will have a great time adding rivers, mountains, borders and more to their maps as part of their geography lessons! My favorite resource for map work in our homeschool is Wonder Maps, since we started using this program I have not had to look for a map elsewhere. Creating models is a great hands-on activity for geography lessons! Whether you use cardboard, salt dough, noodles and coffee filters or something else it doesn’t matter. You and your kids will have fun creating a model of the location you are studying in geography! 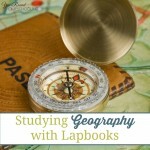 Teaching geography by using lapbooks is another great hands-on learning option! 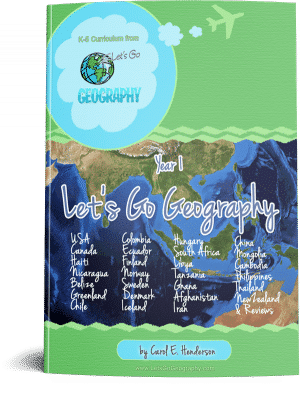 Your kids will be able to design their own study of geography and share the important things they remember from their geography lessons inside their lapbook! Photography can inspire your kids to want to learn about a particular place. Whether it’s a picture they’ve seen or a picture they took on a field trip or family vacation, if they show interest in a certain place in a photograph, make that your next geography location to study! Unit studies are a great way to incorporate all school subjects into geography! While your children are learning about a specific geographical location, they’ll be learning math, science, language arts and more! Try getting started with a NYC, Grand Canyon or Mexico unit study! A great way to see the world together as a family is through family vacations! Why not make the next place you visit somewhere that your children want to learn about in geography? This is an awesome way to allow your children to see, hear and touch places around the world and make educational memories that will last a lifetime! Giving our children the opportunity to see the world through the pages of an atlas is a great way to encourage them to love geography! Atlases aren’t just boring books, they contains lots of amazing information regarding geography. There are so many amazing works of art from around the world! Your kids may see a piece of art from a geographical region that they fall in love with, take this interest and make it part of your geography lessons this year! Kids love to play games and there are so many fun geography board and card games out there! One of our favorites is Scrambled States, we have a great list of educational games here where you’ll find more geography games to try! Learning how latitude and longitude work is an important geographical skill! Geocaching is a fun way to teach your kids all about latitude and longitude! You can get started on your geocaching adventure here. Using digital homeschool curriculum is a great way to study geography in your homeschool! Whether you’re looking for specific country or state studies or complete geography curriculum, there are a lot of digital geography homeschool curriculum options out there. 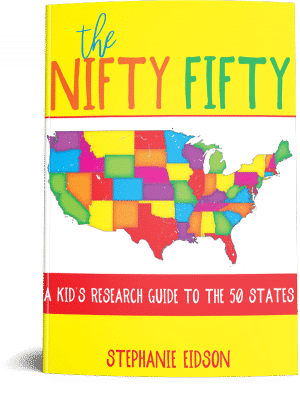 The Nifty Fifty is a United States research project based digital homeschool curriculum for students in 3rd-8th grade. Through this curriculum your students will cover history, geography, science studies and more. As students study each state they’ll complete mapwork, research state facts such as; capitals, state animals, top exports, sports teams, facts about the current Governor, climate and MUCH more! If you’re looking for a research based United States printable homeschool curriculum for your elementary and/or middle school students, this one is amazing! Let’s Go Geography Year One introduces your students to a new country every week, one continent at a time around the globe. They’ll complete hands-on activities, complete notebooking pages, watch fun videos, create crafts and MUCH MORE! This digital homeschool curriculum is designed for students in Kindergarten through 4th grade. Students are encouraged to create a travel journal and add their notebooking pages, photographs (included in the study!) and more to it. There are multiple resources listed for homeschool parents to gather prior to teaching each lesson including books, from the library, craft items, printable maps (links are included! ), the answers for questions are provided which makes this an easy to use curriculum for busy homeschool moms! Geography is an amazing subject to teach in your homeschool. Not only does it encourage exploration and research, but it causes your kids to love discovering the world around them! 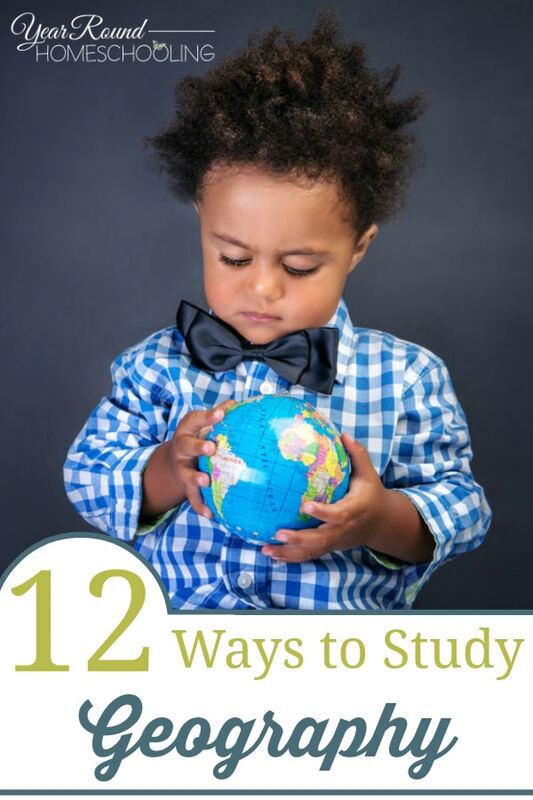 Once you start teaching geography in your homeschool, your kids won’t want you to stop! I’d love to hear how you study geography in your homeschool, share your ideas with me in the comments!